..…now….. and far above the sky. James Young was born on 29th July 1711 the son of Alexander Young, a cooper in Falkirk, and Janet Young. Licensed by the Presbytery of Linlithgow he was called to the parish of New Cumnock on the 29th December 1757, following the demission of the incumbent minister the Reverend Thomas Hunter. The Reverend James Young was ordained on the 3rd May 1758, the fourth minister of the parish of New Cumnock. “The officer was appointed to go to the most patent Door of the Kirk and after thrice calling if any person had any objection against the Life and Doctrine of Mr. Young and why he should not be ordained Minister of this Parish that they come and give them into the Presbytery just now sitting and none having appeared, The Presbytery appoint Mr. Dun to proceed in his oridnation”. Four years later James Young married Elizabeth Hunter, daughter of Reverend Robert Hunter, a preacher at Leadhills and later minister of Kirkconnel and granddaughter to Reverend Peter Rae, also minister of Kirkconnel. Together James and Elizabeth had 13 children, including twins Marjory and Marrion. The Reverend Young is best remembered as Jamie Goose in Robert Burns’ poem “The Kirk’s Alarm” (1789), which poked fun at a number of ministers in Ayrshire, that he believed were set in their ways (the Auld Lichts). The minister had been unsuccessful in prosecuting Hugh Mitchell of Dalleagles captain in the Royal Marines, regarding am ecclesiastical matter. Mitchell was married to Grizzel Logan, sister of John Logan of Knockshinnoch and Laight, a close friend of Robert Burns, a local landowner that had never saw eye-to-eye with the minister. No doubt Logan provided Burns with some information on the minister, as the bard made a reference to Young’s father’s profession – a cooper, in, “cooper’ed an’ ca’s a wrang pin in’t”. It should be remembered the Reverend Young was an aged man, 78 years old, when ‘The Kirk’s Alarm’ was written. Indeed he was minister at New Cumnock from the year before Robert Burns was born until the year before the bard died. Population: It may now amount to 1200, two villages have been built near the church, and on Afton Water, where there was but one house in 1757. There may be 80 farmers and storekeepers and more cottagers, 200 men-servants, near as many woman servants, 400 horses, near 1000 milch-cows and their followers. The number of sheep cannot be easily guessed at. Schools: There is an established school , endowed with a salary L. 100 Scotch, sometimes of 30 and sometimes of 40 scholars; but as it cannot accommodate half of the parish, several private schools are kept in distant parts of it. Produce: The parish produces chiefly bear and oats. Abundance of potatoes are raised and mostly used for the support of inhabitants. Quantities of bear, cheese and butter, are exported, and with them the farmers make up their rents. The crops are liable to several accidents when the harvest is late, and suffer much by early frosts, mildews and shaking winds especially in the marshy and fluid grounds. Minerals: There are various mines of coal and lime which serve the neighbourhood, though little is consumed owing to the want of a navigable river, in which case a greater estate arise from them than the surface of the land. There is now a lead mine working in Afton barony in which a company of Quakers have entered into a contract. Twenty miners are employed and more are expected according to the apparent success. A wodd (graphite) mine was recently was lately found on the estate of the Earl of Dumfries. 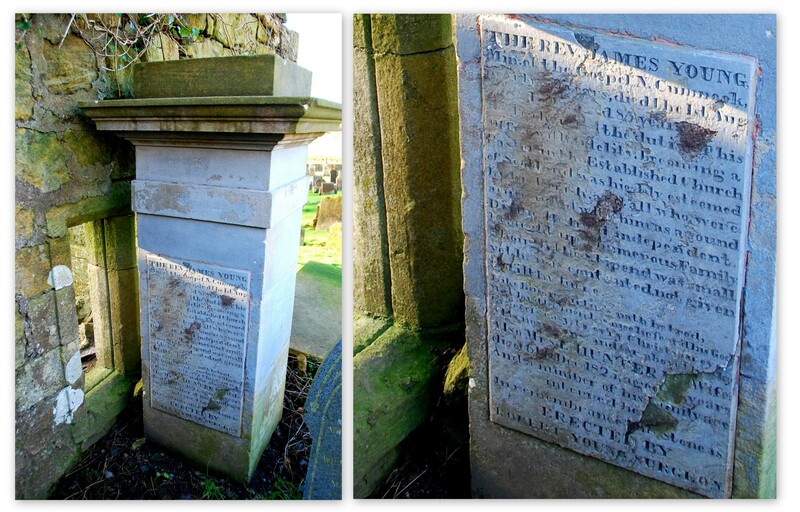 The Reverend James Young passed away on the 1st August 1795, aged 84 years, and is buried next to the Auld Kirk walls with his wife Elizabeth and a number of their children.